Consider former Secretary of State Hillary Clinton’s visit to Hollywood today the start of a beautiful–and lucrative–friendship. While the entertainment community stood divided on which potential presidential candidate to rally behind in 2008, no such conflict exists heading toward 2016. That becomes official today when Clinton appears at a posh charity event in Hollywood chockablock with heavy financial hitters. Conversations with a range of Hollywood figures suggest that there is widespread — if not so starry-eyed — support for Mrs. Clinton should she decide to run for president in 2016, a stark contrast with 2008, and an important early indication of Mrs. Clinton’s standing with some of the biggest donors in the Democratic Party…. [Jeffrey] Katzenberg, who joined [David] Geffen and Steven Spielberg in arranging a $1.3 million fund-raiser for Mr. Obama at Mr. Geffen’s Beverly Hills estate in February 2007, also said he planned to throw his weight behind Mrs. Clinton the next time around. 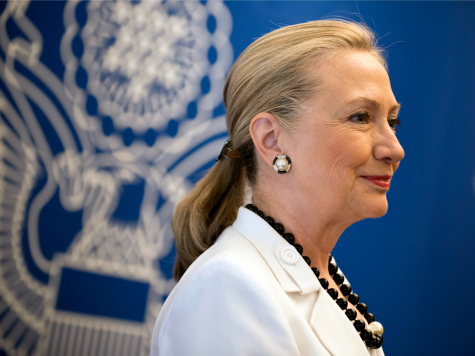 The industry appears unconcerned about the ramifications of its 2008 presidential candidate selection and will rally both its considerable resources and cultural clout to return Clinton to the White House in 2016. Clinton has not officially announced her intentions to seek the presidency in 2016 but party officials have assumed for some time that she will, indeed run and be the candidate to beat come primary season.